During the boom times of the 1920s, the automobile, which previously had a reputation previously as a plaything of the rich, started to become more affordable and attractive to wider social groups. Here in the Bay Area, the infrastructure needed to be changed to meet this personal transportation marvel of the ages. In San Francisco, traffic lights had to be installed to control traffic on major streets by mid-decade, and service stations popped up everywhere to meet the petroleum needs of those machines. Shell Company of California was competing with Standard Oil of California and independent stations to tap that market. In 1926, Shell had 14 stations in the city, and added 20 more by 1927. Major motoring routes added gas stations, and the competition became brisk, with stations offering prizes or decorations to draw in the drivers. A new Shell Station opened on gas-station-competitive Fell Street at the corner of Baker Street to lure in the traffic on this major driving route to the western part of San Francisco. By Christmas time, this Shell Station added a huge holiday tableau, complete with a 25-foot Santa flanked by two brightly colored nutcracker-style soldiers. 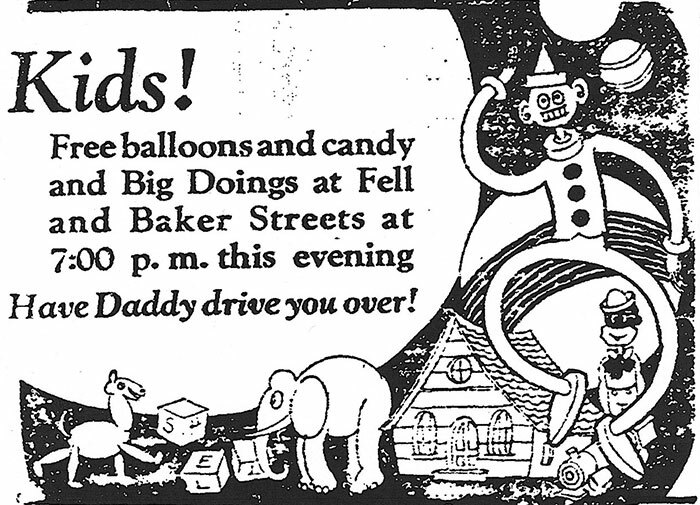 An ad ran in local newspapers on December 10, 1927, encouraging children to pester Pop to drive them over to Fell and Baker that evening at 7 p.m. for free candy and balloons. At the station, the attendants pumped gasoline dressed in elf costumes. It was quite a spectacle. San Francisco Chronicle newspaper advertisement for holiday decorations at Fell and Baker Streets Shell gas station, December 10, 1927. In 1927, the price of gasoline was 21 cents a gallon, and the station had no lube room or products to sell. 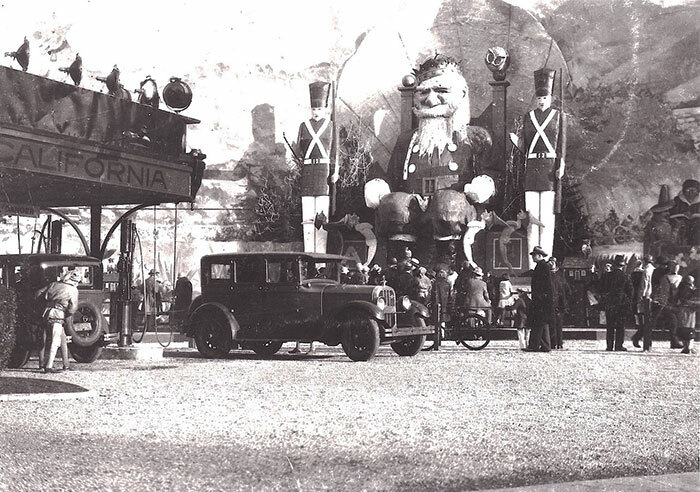 That much effort for such a meager financial return is hard to fathom today, but this was the roaring 1920s, and I guess building affinity to a specific station or loyalty to the brand of gasoline must explain the extravagance of these Holiday decorations, and not profit at the pump. A Shell Station remained on that southeast corner until the early 1960s, and was replaced by the Department of Motor Vehicle Office in 1965, where today there sure are no free candy or balloons!